Richard and Maria Kane presenting some roses to John and Norma Major, David Hodson is featured on the left. 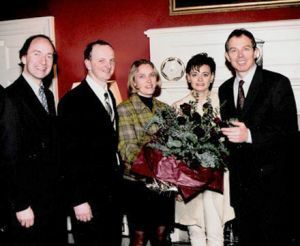 With Tony and Cherie Blair. Marriage Week has always been a collaborative project drawing on a range of organisations and networks to be successful. Since it began in 1996, it’s strength has been the volume of local activity, mainly in churches that has sought to strengthen and celebrate the relationships within their sphere of influence. The project was started by Richard and Maria Kane, while Richard was national director of charity, Marriage Resource. Marriage Week is a primary preventative campaign which seeks to highlight the benefits of healthy marriage to society, media and governments, whilst seeking to educate and inform couples regarding the benefits of an ever improving relationship, through largely church based events, and media coverage. 1997. 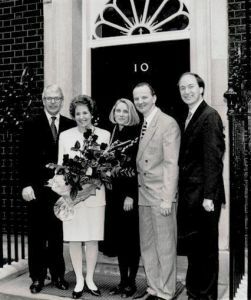 Sees the launch and endorsement of Marriage Week at the official residence of Prime Minister John Major and his wife Norma at 10 Downing St in London. 1998. Sees the launch and endorsement of Marriage Week at the official residence of Prime Minister Tony Blair and his wife Cherie at 10 Downing St in London. 1999. MW wins joint second place at PR Week’s Annual Awards for “Best Promotional Activity of the year”, with other finalists, Kellogs & Lego. 2001. UK Advisory Board launched with partners; Care for the Family, Care, Mothers Union, 2-in-2-1.co.uk, Premier Radio, CWR, Church of England, The Marriage Course & Civitas. 2003. Marriage Week International Annual Conference is launched with participants from four continents. 2007. Tenth anniversary of Marriage Week UK is launched in The Palace of Westminster with Archbishop of Canterbury, Rowan Williams, Chief Rabbi, Jonathan Sacks and Iain Duncan Smith. 2008. 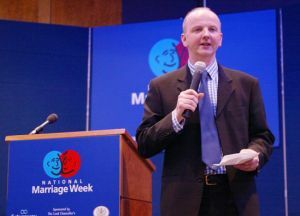 Marriage Week International recognized in Geneva as an officially registered International Association in Geneva, Richard Kane takes up the Presidency of the International Association. 2008. Marriage Week is launched in Germany, Switzerland, Czech Republic, Ireland, Belgium, Hungary and Northern Ireland. 2010. Mary McAleese President of Ireland launches Marriage Week in Dublin. 2011. MW Czech is launched in the Czech PM’s offices with news that over 500,000 people are in MW events that week. Slovakia’s first Lady Silvia Gasparovicova launches Marriage Week Slovakia, 10,000 people attend events. 2011. Richard Kane with Ann Atkins and Anastasia De Vaal leads and wins a debate at Cambridge Union against the motion, “this house will not marry”. 2011. Mayor of Hainichen Germany announces that “since Marriage Week has come to Hainichen the divorce rate has dropped and the marriage rate increased”. 2011. Marriage Week USA takes full page ads in New York Times and is officially recognised by the Senate. 2014. Marriage Week Croatia starts.